This is a wider version of the previous pattern (see here). Take notice of the combination-knots at the start of the rows. 12 Repeats of the pattern is about 14 cm (5.5 inch) long. For 12 repeats you need about 66 cm (26 inch) of purple thread and about 50 cm (20 inch) of yellow thread. 1. Start with placing the threads in the order as shown in the upper part of the picture. So, from left to right in turn yellow and purple. 2. Start at the right side with making a right/left combination-knot with the utmost right yellow thread around the utmost right purple thread, so that it stays at the right after this knot. The yellow thread with which the knot is made, stays at the left. Now proceed to the left by making two double left knots with the yellow thread around the next purple thread and than around the next yellow thread. The yellow thread with which the knots are made, is now in the middle. 3. Now continue at the left side of the band and make a left/right combination-knot with the utmost left purple thread around the utmost left yellow thread, so that the left yellow thread stays at the left and the purple thread on the right after this knot. 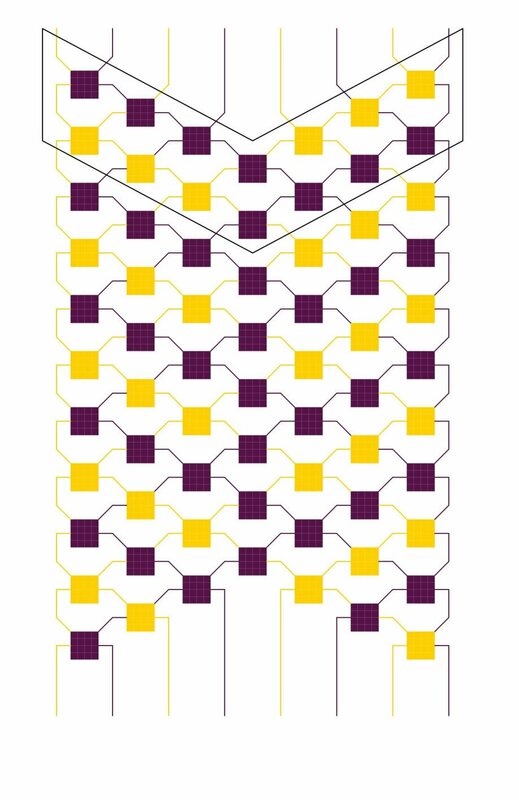 Now proceed to the right and make 3 double right knots with the purple thread around the next yellow thread, then around the purple thread and then around the middle yellow thread. 4. Now again at the left side make 3 double right knots with the utmost yellow thread around the next yellow, purple and yellow thread. 5. Now go to the right side and make 4 double left knots with the utmost right purple thread around the next purple, yellow, purple and yellow thread. 6. Repeat the steps 2 to 5 until the desired length.